Branding blog Fake Thrills – another automotive misfire. 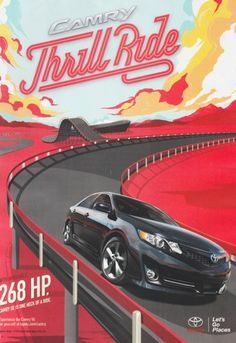 Fake Thrills — Another Automotive Marketing Misfire. >> Fake Thrills — Another Automotive Marketing Misfire. Apparently, there’s a huge segment of the driving population that does not care about horsepower or handling or sexiness. Just reliable, utilitarian, point-A to point-B transportation for this crowd. My father drives one, and he fits the demographic perfectly… white, suburban 80-year old male who only drives a few miles a month. The last thing he’s looking for in a car is a thrill ride. I was enamored with the TV commercial at first. What a great idea… a car as a high-speed turbulent thrill ride captured in a reality-TV format. All they have to do is build a super rad roller coaster style track and then race the car up and down the hills, around the high-G turns, and into consumer’s hearts. Then I realized it’s a Camry commercial. Classic case of a great advertising idea executed poorly for the wrong brand. Once again, we have an automotive brand trying to be something it’s not. And what’s worse, the spot doesn’t even deliver on its ill-advised promise of being thrilling. The so-called “thrill course” features one little hill, a banked turn, and a tunnel. There are relatively young, hip people riding shotgun as the Camry inches its way around the course. It’s a reality TV on Geritol. I can understand why the Brand Managers at Toyota would want to appeal to a younger audience. And I can even go along with the premise of being a little bit more fun. But why do it in a way that’s utterly fake and out of context? Why couldn’t they advertise the car’s popularity and reliability and resell value, but in a fun way? “Among the boring sedans targeting people over 50, the Camry is the MOST FUN!” That, I could buy. But there’s no way Toyota will every convince people that the Camry is thrilling. They could launch one into space and parachute it back to earth, RedBull style, and it’d still be a boring brand. But in this case, boring is good. People eat it up! Why are they trying to be something else? There are plenty of thrilling cars already on the market that don’t sell nearly as well as the Camry. Assuming you built a thrill course worth its salt, the spot would work brilliantly for BMW’s Mini brand. The Mini is a car that runs on rails, delivers thrills and is genuinely fun in every way. The analogy works. With the Camry it falls on deaf ears. At the end of the commercial one of the actors says, “like maybe I’ll look at a Camry differently.” That sounds like a line stolen right from the creative brief under the header “objective.” I seriously doubt this spot will do it. And more importantly, why would Toyota want people to look at the Camry differently??? Seems to me, looking at it as the #1 selling car in the country with outstanding resell value and a super-high reliability rating would be plenty. So here’s some advise for brand managers and business owners… if you’re lucky enough to have the best-selling brand in your category, don’t pretend to be something else. Don’t lighten your offering in order to appeal to a seemingly broader audience. Stick to your core. Resist the temptation to leverage your brand it into some other line of work. For example, if you’re Guinness Stout you don’t start advertising an American-style lager. If you’re Harley Davidson you don’t start advertising a new line of lightweight motocross bikes. If you have the best selling sedan in the country that happens to be a bit vanilla, don’t try selling yourself as a spicy hot sporty sedan. You’re wasting your breath.